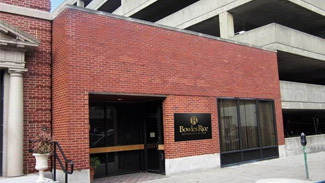 The newest Bowles Rice office, in downtown Wheeling, West Virginia, allows us to serve our clients throughout the Northern Panhandle and Ohio Valley. In addition to convenient on-street parking directly in front of our office, visitors may park next door, in the McClure Hotel’s parking garage, and have their parking card validated. Take the I-470 W exit towards Columbus. Merge right onto US-250 N towards Wheeling. Go straight at the first light onto 250 N.
Take the 18th Street / Downtown Exit. At the end of the exit ramp, get in the left lane. Turn left at the first traffic light onto 16th Street. Turn right at the next traffic light onto Chapline Street. Continue straight for one and one-half blocks. Bowles Rice is located in the red brick building on the left. Park in the parking garage located beside our building. Please remember to bring your parking card with you, so we may validate it. Continue on I-70 E, towards Wheeling. Take the Main Street Exit (1A) and merge onto US-40 towards Downtown. Turn left at the fourth traffic light onto 12th Street. Turn right at the second traffic light onto Chapline Street. Bowles Rice is located in the red brick building on your right, just after the parking garage.